I haven't had much sewing room time since coming home from Texas. For whatever reason, everything seems to be "landing" at once. I've been obligated to do other things. On Monday, Central Florida MQG welcomed a guest speaker, so much of the day was spent helping make sure the workshop and lecture happened as planned. Carole Lyles Shaw is a good instructor and presenter. 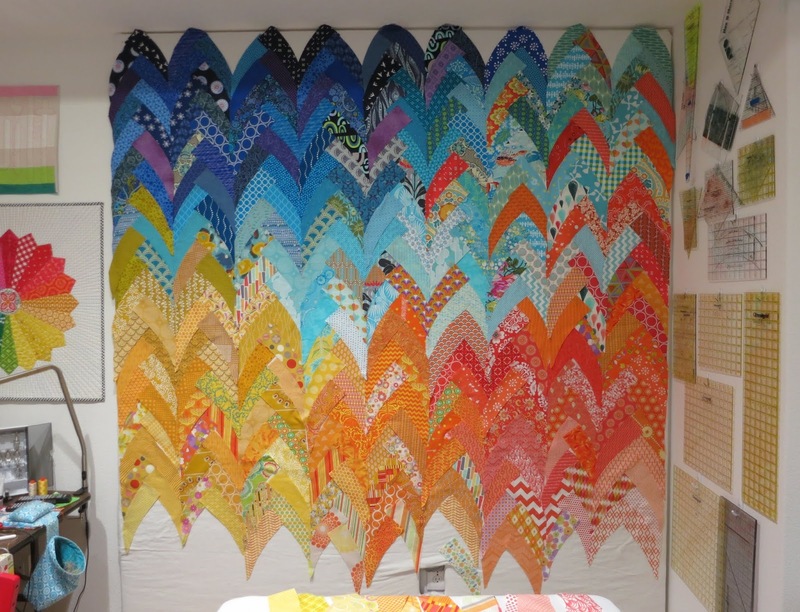 You can read more about her improv quilts on the two Central Florida MQG blog posts I wrote this week: workshop and lecture. 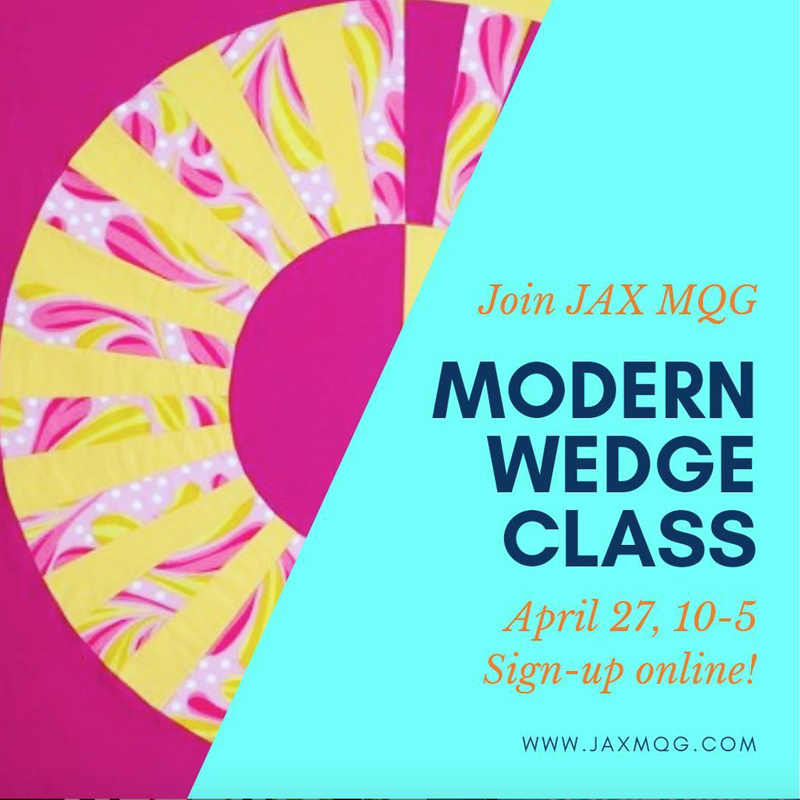 Another activity has been to prepare for an upcoming workshop with the Jacksonville Modern Quilt Guild (Jacksonville, Florida). 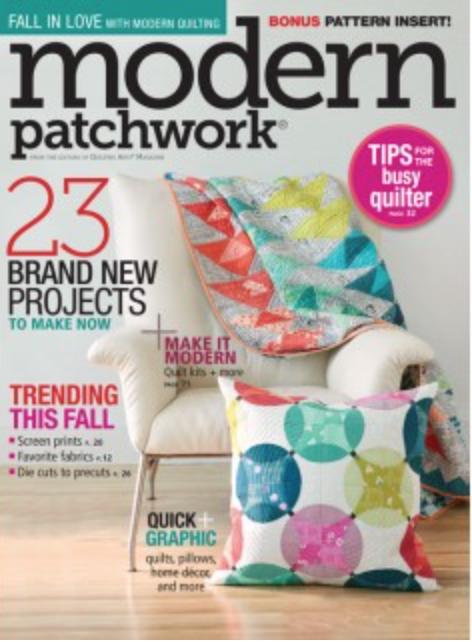 I've designed a small modern wedge quilt - I just finished quilting it -and will teach a six-hour workshop. I'm really excited to visit their chapter as I've exchanged emails with several members who I have yet to meet IRL. Also, I'm spending time editing a book. My 89 year-old dad is writing his autobiography, for family only. 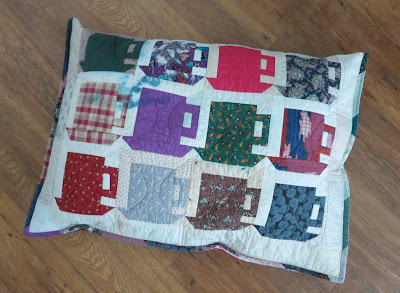 Having a journalism degree as I do (earned in 2000 as a non-traditional student), and having written for quite a few quilting-related publications, including writing a quilting book, it makes sense that I would edit his book for him. As dad completes each chapter, he emails it to me for me to adjust and return to him. We're up to chapter ten now. At this point in his storytelling, I'm 10 to 11 years old, so I remember some of what he's been writing about. Perhaps not surprisingly, we're remembering a few things differently, so there's been some give-and-take as we're going along. Anyway, I've been at the computer. 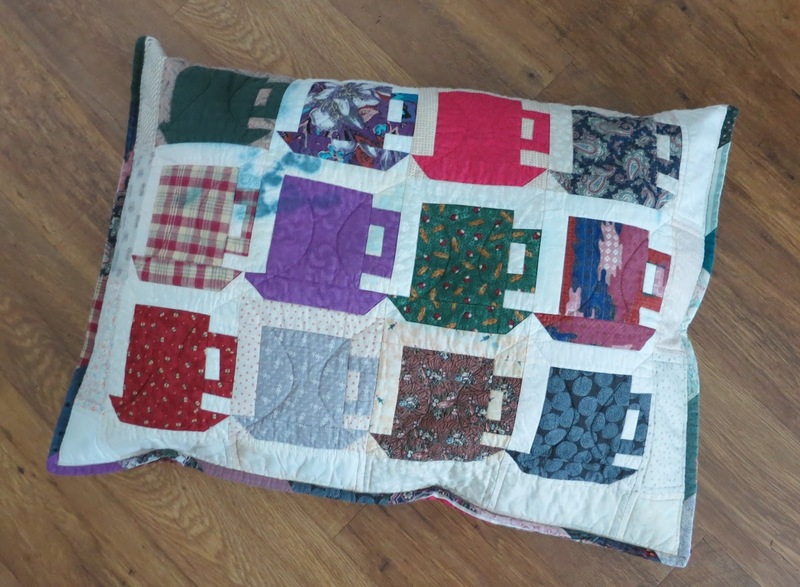 With a little help from Central Florida MQGers who attended retreat and gathered their trimmings, this week my old quilt was filled with enough bits of fabric, batting and thread to be sewn closed and donated as a pet bed for an area animal shelter. I have at least a half-dozen more wall quilts that will receive the same treatment. Needing a bit of a break, last evening I spent a couple hours putting already-cut-out Curve Braid Strips on my design wall. For the full-sized quilt I want to make (from Victoria Findley Wolfe's book Modern Quilt Magic), I will need all nine columns shown here, and 57 pieces (!) in each column. Right now, about 35 pieces are in each column. Obviously, my design wall isn't large enough (it's 72" X 72") to hold all the pieces! I'm not quite sure how this is going to work out, as I really don't want to begin sewing columns together - they are sewn from the bottom to the top! - until the whole thing is laid out and I'm completely satisfied with the arrangement. I'll probably have to move out the table top and sawhorses in front of the design wall so as to spread a sheet on the floor to keep laying out pieces. Yesterday, Dan and I went to The Sharon, a performing arts center here in The Villages, where we saw "Artrageous." Ten young people kept us entertained - singing, dancing, painting, puppeteering, and doing comedy. We were in the second row, so it wasn't too surprising that one performer stepped down from the stage to take Dan's hand and lead him onstage as a backup dancer. Dan good-naturedly participated, even playing air guitar! I've been listening to an audiobook, mostly while in the car and walking Hogan, and this week finished Nine Perfect Strangers. 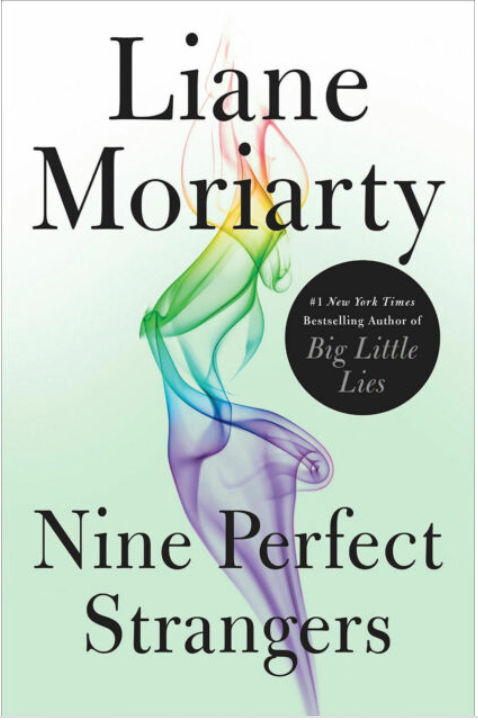 This is the sixth Liane Moriarty book (Big Little Lies) I've read, and it was as engaging as the others. Basically, it's about nine people who go on a ten day transformational - mind, body, and health - retreat. Each person has a unique back story, as does the retreat director, "Mah-sha" (Marcia). Of course, there's an unexpected twist. At least, I didn't see it coming! I adore listening to narrator Caroline Lee, who like the author, is Australian. All the Moriarty books I've heard have been read by her. As most of you know, I've been to Australia four times, so I have a special place in my heart for all things Australian. I thoroughly enjoy Liane Moriarty books! A busy few days for you, Linda, and I'm sure you'll relish your quiet time in your studio once it all subsides. I hope the class goes well, and hope the students appreciate you! How interesting that your Dad is writing his autobiography. Wouldn’t it be great if we had written memories of our parents and grandparents? I wish I had written down my own mom’s story. Editing your Dad's book- what a treat, and a revelation I'm sure. Interesting how different memories emerge from the same circumstances. You certainly stay busy. A friend calls times like you've been having "vortex weekends" where everything seems to be happening at once. This weekend is one of those for me- several good things happening and I sure can't do them all! I love that your Dad is writing an autobiography for his family. Recording family history and stories interests me but I never seem to make it a priority. Good luck with the wedge class. I bet it will be good. Can't wait to see the curve braid fill in. It's going to be stunning. Full of your colors! Great update on your adventures, Linda. My dad is writing his, he has kept diaries since he was a kid. I love my daddy so much. It makes me happy that you are doing this with him. Just wait until he is 95 (har har) My daddy is a hoot, but he still has his wits about him. I agree with Anne- it's great that your Dad is writing his memoir. I always wish I'd interviewed my mum with a tape recorder and have her talk about her interesting life..... But of course, I never got around to. I hope you solve the problem of piecing the Curve Braid quilt. It's going to a be a beauty! You are one busy lady! I love your curved braid quilt-in-progress. Striking colours! I agree with the other commenters, how wonderful your Dad is writing his autobiography. What a treasure it will be for future family members. I'm visiting form Wendy's Linky Party, hope you'll stop by to visit me too!